This 94 page ebook is now free as a resource to start you off on your research, although donations are very welcome as this takes us a LOT of time, thank you. 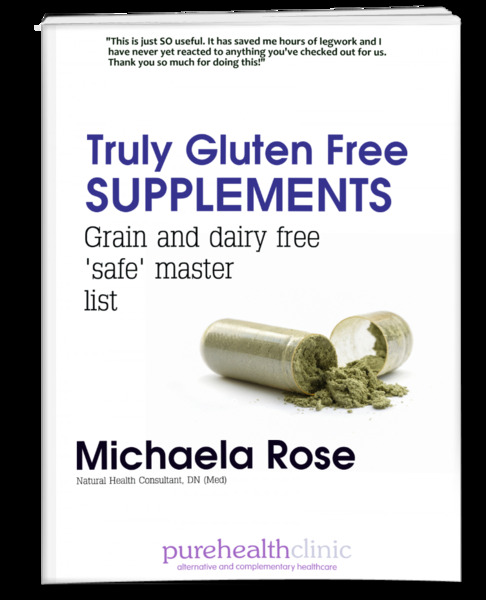 The ebook gives you details of all the truly grain and dairy free supplements (and some meds) we have found up to the last update. It outlines the need for and the problem finding truly gluten free supplements that are free of gluten from all grains and not just free of gliadin. All grains contain a form of gluten and many supplements contain grain-derived ingredients, especially from corn, even if they are labelled gluten free. This makes some gluten sensitive people ill and can certainly scupper healing. This ebook also teaches you how to recognise the problem ingredients as well as how to question suppliers yourself effectively. It gives you a TGF-safe wellbeing protocol to boost your nutrients again and suggests add-ons for specific conditions. Most supplements, even if they state they are gluten free, are anything but since all grains contain a form of gluten. Some gluten-sensitive people will react to all glutens, not just to the gliadin in wheat, rye and barley. When a supplement says it is 'gluten free' it means it is free from one gluten fraction called 33-mer gliadin rather than actual gluten, and even then it can contain up to 20ppm in line with current coeliac regulations. Myself and many of my patients and readers of the TrulyGlutenFree blog react to the very supplements they need to get well simply because they still contain enough grain gluten to make them ill. Those supplements can then cause symptoms and prevent healing. It's a vicious circle. As an example, look at corn. Many supplements contain ingredients made directly from corn - would you know that pretty much all Vitamin C is made from corn? - and even more use corn as a starting material but then state they are 'corn free' on the label - citrate minerals and digestive enzymes for example. Corn doesn't have to be included on labels in most countries because it is not yet classed as an allergen that has to be labelled. Happily, some companies label it anyway, but very few would ever label an ingredient that used corn in processing to make the final ingredient, and therein lies the problem. What 'corn free' means is that the company has tested it to contain no corn protein antigen, but what about the starches or other elements? It is enough for people to react to if corn-sensitive. The manufacturer would say 'there is none left in the finished product' which is undoubtedly true if you take that to mean corn protein antigen. But our bodies react anyway; mine certainly does and, from clinical experience, so can yours! Hang on, you say this is free?!!! The Truly GlutenFree Supplements Master list has been a paid-for item with free updates for a long time - almost 5 years, I can't believe that! - but I have now decided to make it free for everyone and stop doing so many updates. Gulp. 'Cos it's a LOT of work and the list is almost out of date as soon as I publish it quite frankly! The good news is that there are, thankfully, a lot more TGF products about now and more suppliers for us to go at other than the very few I found originally. We don't want to be restricted to an update every few months so are trying a new way for us all. Even more thankfully, our little TGF world where everyone thought we were mad, has mushroomed and even on our own TGF Facebook group, we have hundreds of 'expert patients' who regularly help each other finding stuff. I think actually we are still the only group who really understands the complexities of grain and dairy free supplements and meds, by the way - I thank you :). Download the existing master list here. It can be used as a starting place for your research, but must not be relied upon as gospel now as we are no longer doing the updates so frequently. It was accurate at the time of the last update. Christine - aka TGF Supplement woman! - will help direct you to what we consider TGF safe at the time and other people will chime in with what they have found, no doubt. Clearly, that is still a lot of work for us to administer and we have also given away a really important document and are losing sales as a result. You guessed it: in return for all this free help, we need something from you! We've produced a new list of recommended suppliers and ask you to use them when ordering anything if you value this info and want to support us. It makes a huge difference and will help offset the lost sales and enable me to pay the team! Using these suppliers will trigger a small commission payment for us but won’t cost you any more. It helps pay for all the time we spend gassing on email, live chat, Facebook, Twitter, Pinterest and blogs, answering questions and researching stuff that benefits us all. Thank you for your loyalty and support; it means a lot!